Talented Frenchman Nordine Oubaali 15-0 (11) captured the vacant WBC bantamweight title with a unanimous decision against Cincinnati’s Rau’shee Warren 16-3 (4) at the MGM Grand in Las Vegas, Nevada on Saturday night. 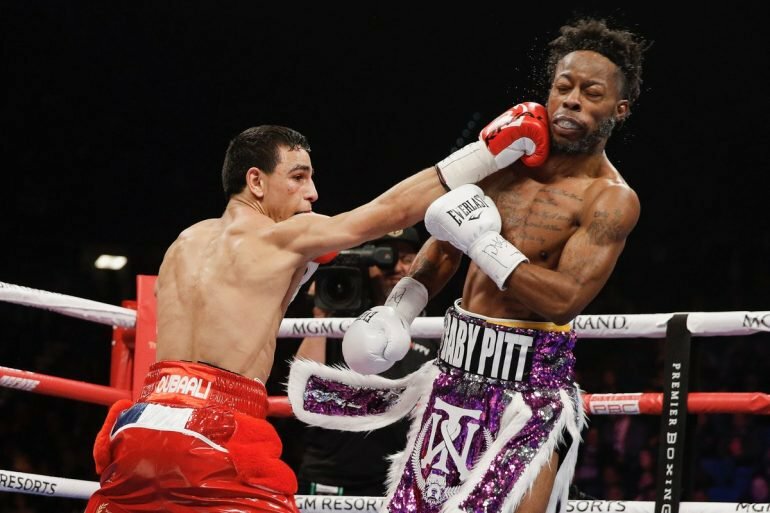 Fighting in one of the main support bouts to Manny Pacquiao versus Adrien Broner, Oubaali was award the 12-round victory by scores of 117-111, 116-112 and 115-113. The fight was competitive through the first six frames with just a handful of punches separating the two. But Oubaali took control of the fight in the mid-rounds and finished stronger down the stretch. Former world champion Warren, who holds victories over quality campaigner McJoe Arroyo and Juan Carlos Payano, paid credit to his old amateur foe Oubaali, who defeated him 19-18 in the opening round at the 2012 London Olympics. “I felt like I was doing pretty good in the beginning of the fight but after the fifth or sixth I let off the gas,” said southpaw Warren, 31, a three-time Olympian. Oubaali made his intentions known in the seventh round as he went on the attack and hurt Warren with some hard combinations. From there the undefeated boxer from Romainville took over the fight, outlanding Warren 100-51 in total punches in the back half of the fight.